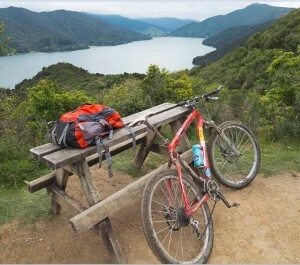 The Queen Charlotte track has a reputation as one of the best mountain bike rides in the country. 70 km long, it is New Zealand’s longest continuous stretch of singletrack. Last summer I had sampled short sections at the accessible Anakiwa end, and was blown away by the stunning scenery and the smooth flowing trail. With my appetite whetted, I was keen to complete the track in its entirety. So when Justin suggested the challenge of tackling it in one day, I jumped at the opportunity. Aware that the recommendation was to allow 2-3 days, we made an early start. 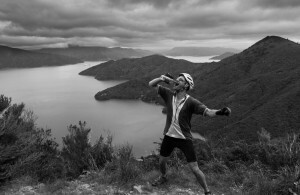 Under a leaden mid-November sky, we mounted up at Ship Cove towards the head of the Queen Charlotte Sound. Our initial enthusiasm was tempered as we were forced to dismount for the very first climb. However we were soon back on our bikes enjoying the magnificent vista of Resolution Bay below. With the toughest of all the climbs already behind us, we sampled the day’s opening descent. Wow! This was better than any roller coaster – sinuous and snaking yet wide enough not to be intimidating for beginners. We met up at the bottom for the first of many meal breaks with huge smiles on our already mud-splattered faces. So the tone of the day was set – lengthy climbs, followed by incredible descents. All amidst beautiful native bush interspersed with great views of the Marlborough Sounds. There is a fair amount of flat or slightly undulating terrain, but to tackle the QC track in its entirety you’ll need to be able to cope with some long climbs. Of course you can always just dismount and push your bike, but there’s a certain satisfaction to be had in cresting the ascents via pedal power. And the good news is that the track is almost always a couple of metres wide. It’s doable for anyone with reasonable fitness and with a little past experience – not just hard-core, semi-insane mountain bikers. There’s also no shortage of comfort stops along the way, with a range or accommodation and dining options. These establishments will require you to take a slight detour from the main track, down into one of the many idyllic bays. We, however, weren’t intending to make use of the accommodation. Riding the track in a day does force you to keep an eye on the clock, and after 8 & 1/2 hours we reached Te Mahia saddle. Only 12 kms and the final descent to Anakiwa remained. It’s at this end of the track that you do need to take extra care. The smooth trail goads you to increase your speed, though there’s also an increase in the number of hikers. There were no mishaps however (despite our growing exhaustion) and with tired legs, we pulled up beside the Outward Bound school at Anakiwa. Reflecting on an unforgettable ride, I felt privileged to be able to enjoy this remarkable trail on a bike. 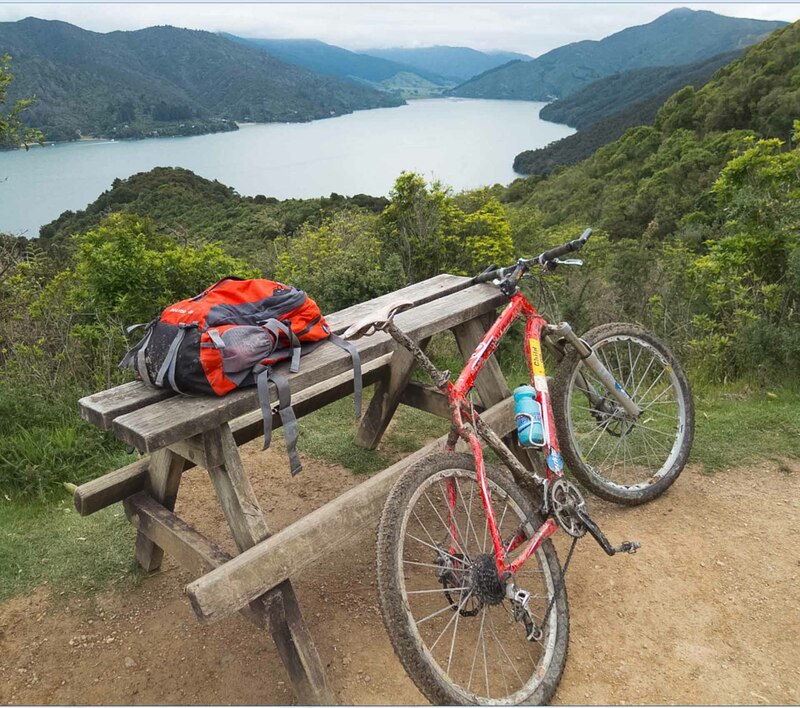 Like the Heaphy, the Queen Charlotte track appears to be a great example of bikers and hikers co-existing well. As a cycling experience, it has to rate as one of the best.